The centaureas are reliable, long-blooming, sturdy, easy to grow plants. The group includes native, naturalized, and cultivated species. These are valuable sources of nectar and pollen in most regions. Generally frost tolerant, they withstand temperatures slightly below freezing. Most are suited to zones four through 11. With around 450 species worldwide, a number are native to Europe and Asia. These can be hardy annuals, biennials, perennials, or sub-shrubs. The invasive spotted knapweed (Centaurea maculosa) was covered in a previous article. On average, the honey crop is around 50 to 80 pounds per colony. The honey color can vary by plant species. Typically, it has a pleasing flavor. Members of the daisy family, these are usually one to four feet tall and generally upright. Often lobed, the feather-like foliage varies in appearance by its location upon the plant. Usually, the lower leaves form a basal rosette. The upper foliage is often toothed. These bear showy, thistle-like flower heads. The flower color and the flowering period vary by species or variety with annuals generally blooming from late Spring until frost. Blossoms are usually blue, pink, yellow, white, or various shades of purple to lilac. Bees are particularly attracted to the blue and white flowered ones. The one-to-two-inch-wide flower heads are usually hemispherical or spherical. They arise from a prominent whorl of large, overlapping, fringed bracts. The crowded individual florets can be tubular, elliptical, or lobed. The fertile disk flowers are typically surrounded by very showy, conspicuous sterile ones. Cornflowers and the other cultivated species are grown in containers, flower beds, and rock gardens. Some perennials are treated as annuals and are grown as bedding plants. Numerous varieties are available with double-flowered ones being unsuitable for bees. In warm climates, partial shade is best. Elsewhere, full sun is needed. Preferring a well drained soil, centaureas adapt to most average, rich soils with a pH of six to seven. Most perennials are somewhat drought tolerant. Globe centaurea and mountain bluet require a moist soil. Plant seeds of perennials and biennials during the Spring or Fall. Annuals should be planted during the Spring in cold climates. 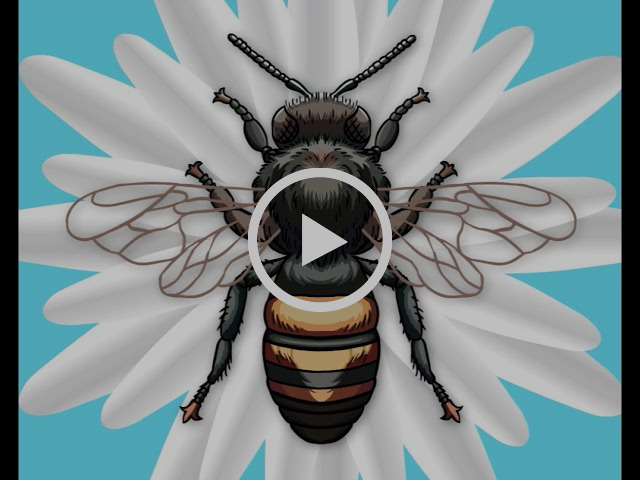 Bee gardeners in warm climates can sow them in Autumn since the plants prefer cool conditions. Seeds should be planted 1/8 inch deep in containers, or ¼ inch if direct sown. The perennials can also be grown from divisions or cuttings. They can be divided every two to four years during the Spring. Space plants about ¾ to two feet apart in the bee garden, depending on the species. Prepare the soil well, adding organic matter and fertilizer before planting. Centaureas need a steady supply of fertilizer throughout the growing season. Pinch the plants back to keep them compact. Deadhead centaureas to encourage reblooming. Generally, these experience fewer disease and pest problems than most garden flowers. However, they can suffer from downy and powdery mildew, rust, thread blight, southern blight, rust, and white mold. Of all the various centaurea species, the following are among the best for bees. Mainly native from the Plains to Arizona, this is also found from Texas to Missouri, Arkansas, and Louisiana. It frequents pastures and prairies. Reaching three to five feet in height with a three foot spread, this erect annual features thick stems. Mostly entire, the rough, oblong to lance-like foliage is four inches in length. The large flower heads, six inches wide, emerge from May through August. Closing at night, these are lilac-rose to purplish-rose or pale pink. A popular garden flower, it is also called bachelor’s button and bluebottle. 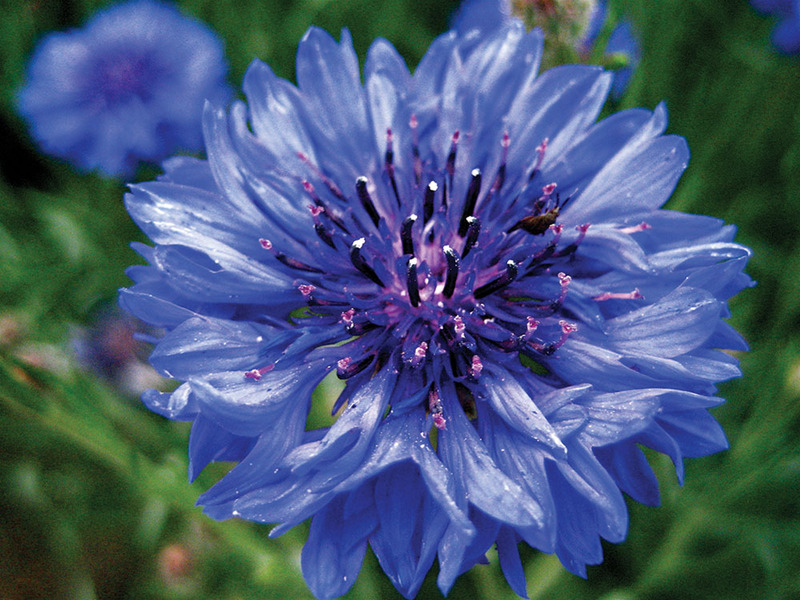 Introduced from Europe, cornflower has naturalized in all states except Alaska. This frost tolerant species inhabits roadsides, waste places, and fields. A slender, upright, erect, branched annual, cornflower reaches two to three feet in height. Covered with gray woolly hairs on the underside, the linear to lance-like foliage is eight inches long. While the basal leaves are lobed, the others are either entire or sparsely lobed. The tufted, round, solitary flower heads are 1½ inch wide. They emerge during Spring and Summer on long stems. Usually vivid blue with lighter colored centers, the blossoms can also be white, pink, purple, or violet. Green, fringed bracts surround the flower heads. Throughout the daylight hours, bees work cornflowers. The unopened flower buds and seed heads contain extrafloral nectaries. The blossoms can yield 0.43 mg of nectar per blossom daily, while flower buds produce five mg.
Cornflowers can provide around 100 pounds of honey per colony. This can be dark amber with greenish tinges to yellowish amber or yellow-green. Sometimes, the honey has a slightly strong or bitter flavor. Also known as giant knapweed, this cultivated species is suited to zones four through . Native to Turkey and the Caucasus, it is a frost tolerant, clump-forming perennial, three to five feet in height. The stiff, leafy stems bear lance-like foliage, eight inches in length. Flowering from mid to late Summer, the globe-shaped, golden yellow blossoms are three inches wide. These feature fringed, shiny, showy, brown bracts. The flower stems are largely leafless. This European native has naturalized in various states, including Wyoming, Utah, North Dakota, Iowa, Idaho, Indiana, Kentucky, Ohio, Connecticut, Maine, New Hampshire, New Jersey, and New York. It grows along roadsides, woods, pastures, fields, and open cliffs. Tolerating salt spray, this plant is very leafy at the base. A variable, erect, branched, hairy perennial, greater knapweed is up to three feet tall. It features angular, branched stems. The rough, deep green leaves can be toothed or pinnately lobed. The upper foliage is small, lobed, stalkless, and mostly linear. The large, solitary, showy flower heads are two to three inches across. Emerging on long spindly stems, these display prominent purplish-red florets and green bracts. Also called Spanish buttons, this was introduced from Europe. Naturalized along roadsides and in fields, this is found from Washington and California to Montana, Minnesota, and Iowa eastward to the Northeast. This variable, coarse perennial with harsh, branching stems reaches 3½ feet in height. The lower leaves form a rosette. The foliage can be oval to lance-like. The upper leaves are much smaller. Similar to greater knapweed, this bears small, purplish-rose flower heads, 1½ inch wide, from July through September. These feature blackish or brown bracts. Hardhead is a valuable nectar plant. The golden, thin bodied honey is considered fair to good quality. Sometimes, it can taste strong. Also known as Lombardy star thistle and tocalote, Maltese thistle is native to the Mediterranean region. This has naturalized in the Northwest and Southwest as well as in Missouri, Wisconsin, Indiana, Alabama, Georgia, South Carolina, Delaware, Pennsylvania, New Jersey, Rhode Island, and Hawaii. Preferred habitats include fields and pastured hills. While this naturalizes, it generally isn’t as persistent as the others. The seeds, sometimes found in ballast, can be a contaminant in grain and grass seeds. Similar to star thistle, this rough annual is covered with slender, purplish spines. Appearing in late May and June, the yellow flower heads open in bunches of three or four. The floret tips feature short spines. Maltese thistle is an excellent bee plant. Mostly pale amber, the good quality honey has a pleasing flavor and good body. Also called mountain knapweed and perennial cornflower, mountain bluet does best in zones three through nine. This frost and drought tolerant, woolly, mat-like, European perennial spreads by creeping underground stems and seeds, which readily self sow. It has naturalized in various states, including Washington, Oregon, Utah, Wyoming, Montana, Arkansas, Idaho, Minnesota, Wisconsin, Michigan, Pennsylvania, New York, New Hampshire, and Maine. Mountain bluet features two-foot-tall, winged stems. The slightly winged, stalkless, toothed foliage, 2½ inches long, can be broad, ovate, or lance-like. With brownish-black fringe, the blossoms resemble cornflowers except for the wider flower heads. While the central florets are reddish-pink, the outer ones are usually some shade of purple, violet, or lilac, rarely white. The blooms are much favored by bees. The flower heads contain dark extra floral nectaries. Sow seeds in late Summer, or take root cuttings in Winter. The plants are typically staked. Black Sprite, reaching 1½ feet in height, is a newer variety with black blossoms. About two to three feet in height, Persian cornflower is equally wide. Often needing staking, this cultivated, clump forming perennial is suited to zones four through nine. The deeply lobed foliage reaches eight inches in length. The lavender to rosy-pink flower heads are 1½ inches wide. Opening late Spring through mid-Summer, these contain showy outer, forked florets with pastel centers. Originally from Russia and Asia, this creeping perennial naturalized in the West, Midwest, and Central regions. It inhabits fields, ditches, pastures, waste places, and roadsides. Considered a noxious weed, Russian knapweed spreads by seed and creeping underground stems. Bushy with many stiff, branched, ridged, leafy stems, this is two to 4½ feet tall. The alternate, firm leaves vary in shape. Forming a rosette, the basal foliage is lobed and four inches long. Generally small, the oblong stem leaves are often lobed or toothed and only half as long. Blooming from June through October, the small, solitary, cone shaped, flower heads emerge on leafy bracts. The tubular blossoms can be purple, pinkish-rose, or bluish-lavender. Russian knapweed can provide a good crop of light colored honey. Sometimes, this has a slightly bitter, unpleasant flavor. Native to the Caucasus, Turkey, and the Mediterranean region, this half hardy, cultivated annual requires a long growing season. Preferring warm conditions, it reaches about two feet in height and is half as wide. Sweet sultan features thin, gray-green, toothed foliage. The basal leaves are four inches long. Opening on long stems, the fringed flower heads are about two inches wide. The sweetly scented blossoms can be yellow, red, pink, purple, lavender, or white. Shaped like those of the common cornflower, the flowers feature spectacular, silky, dainty outer florets. Also known as yellow thistle, this has naturalized locally in all states except Arkansas, Louisiana, Mississippi, and Georgia. A major bee plant in the West, yellow star thistle was introduced from the Mediterranean region and Asia. Yellow star thistle grows in fields, hedge rows, waste places, pastures, rangelands, and along roadsides. It can occur at slightly over 8000 feet elevation. Forming thickets, the plant spreads in warm climates by seed. This tap rooted, bushy species prefers dry soils. Generally an annual, it can become a biennial in warm climates. The drought resistant plant is frost sensitive. The winged, rigid, branched, grayish, woolly stems can be eight feet tall. The woolly leaves are alternate. The basal foliage forms a rosette. Usually entire, the stem leaves, sometimes winged, are narrow and pointed. This is named for the vivid yellow, tubular blossoms, opening from July through October. The green bracts feature soft yellow spines at the base. The stalkless, urn-shaped flower heads are solitary and terminal. Yellow star thistle is an especially good honey plant in California and the West. Drought temporarily stops the nectar flow, but it begins anew once rains return. Generally, this provides a slow, steady nectar flow of .123 mg per flower daily. These plants can bring 50 pounds or so of honey per colony. Often granulating, this extremely sweet, heavy bodied, high quality honey has an excellent flavor. It can be almost white, profound white, extra light amber, yellow, green with yellow tinges, or greenish. Hardy to zones three through 10, one biennial knapweed species (Centaurea rothrocki) occurs only in New Mexico and Arizona. Typically blooming the second year, dusty miller (Centaurea cineraria) is a highly heat tolerant, tender perennial. Hardy to zone seven, this is mainly grown as an annual for its gray woolly foliage. Connie Krochmal is a writer and beekeeper in Black Mountain, North Carolina. Next articleAsk Phil! He Knows!